68464 Andreyeva by Repin Description English: Portrait of actress Maria Fyodorovna Andreyeva. Oil on canvas. 134 ?? 85 cm. The National Art Museum of the Republic of Belarus, Minsk. Español: Retrato de la actriz Mar? ?a Fi? ?dorovna Andr??yeva. Óleo sobre lienzo. 134 ?? 85 cm. Museo nacional de arte de la Rep? ?blica de Bielorrusia, Minsk. ?????????????? : ?????????????? ?????????????? ?????????? ?????????????????? ??????????????????. ????????? ?, ??????????. 134 ?? 85 ????. ???????????????????????? ???????????????????????????? ?????????? ???????????????????? ??????????????? ?, ??????????. 71729 Dragonfly. Portrait of Vera Repina Dragonfly. Portrait of Vera Repina, the artist's daughter. Oil on canvas. 111 x 84,4 cm. The State Tretyakov Gallery, Moscow. 71759 Portrait of Lydia Kuznetsova Portrait of Lydia Kuznetsova. Oil on canvas. 117 x 64 cm. Private collection. 71910 Portrait of pianist and professor of Saint-Petersburg Conservatory Sophie Menter. 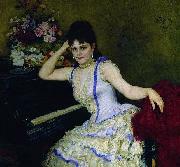 Portrait of pianist and professor of Saint-Petersburg Conservatory Sophie Menter. Oil on canvas. 107 x 115 cm. State Tretyakov Gallery, Moscow.